Marriage counseling is the most common kind of counseling that I do. The reason for this is because marriages are the most common, long-term relationship between two people. Children typically leave home after a couple of decades. Siblings tend to separate from each other as they seek marriage partners. If you want to be free to serve Jesus, there’s no question—stay single. Marriage takes a lot of time. But if you’re going to become more like Jesus, I can’t imagine any better thing to do than to get married. Being married forces you to face some character issues you’d never have to consider otherwise. If you put two sinners in a room (home) for an extended period with no plan for escape, you can expect problems. There may be a lot of love and other satisfying things happening in their home, but there will also be problems. It’s unavoidable. The dating couple can break-up and go on to the next relationship. Vocational relationships are similar. If you don’t like your boss or the environment in which you work, you can move on to the next thing. It’s easy and even fun to get into, but there was never an intended escape route, other than death (Matthew 19:8). Sadly, too many couples do create another kind of escape route. It’s called divorce. 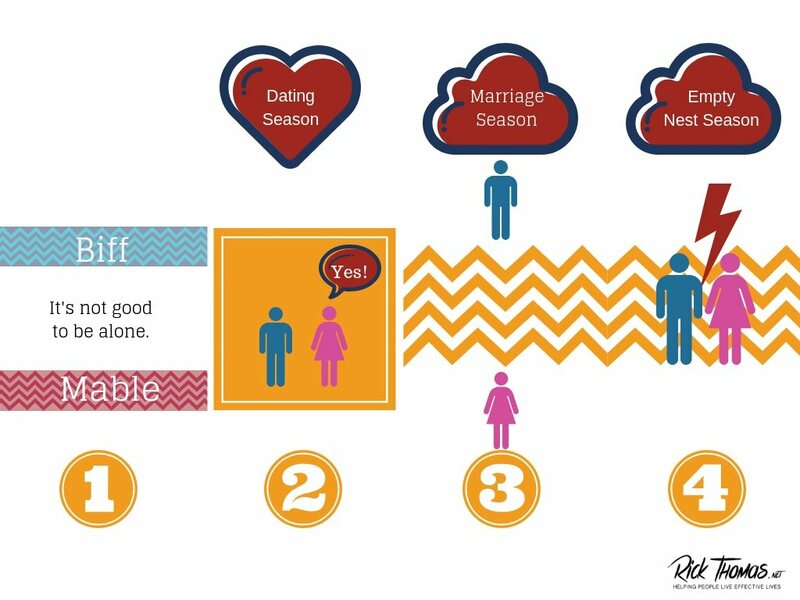 Below is an infographic with explanatory notes of the most common dating to divorce chronology that I have encountered during my counseling career. Biff and Mable begin to date. Biff and Mable fall in love. Biff asks Mable to marry him. Biff and Mable plan a wonderful life together. Mable gets mad at Biff. Biff gets mad at Mable. The road gets bumpy. Biff starts working extended hours because it’s hard to live with Mable. Biff figures being a provider is better than nothing. Biff becomes a “superstar” at his work. Everybody loves Biff. Biff flirts with a woman at his job. Mable continues to be angry with Biff. Mable becomes consumed with her children because it’s hard to live with Biff. Biff and Mable become preoccupied with life. Biff and Mable appear to be the model Christian couple. Biff and Mable’s children become teenagers, more independent, and spend less time around the house. Biff and Mable still do not like each other. They become even more snippy and unrepentant. Biff and Mable get a divorce after 29 years of marriage. Their local church is shocked. People don’t understand. Broken due to the fall of Adam. Broken due to the shaping influences of others and other things. Broken due to the choices that they have made. By the time a person enters into a dating relationship, he (or she) comes into that relationship with baggage. We all have baggage: fallen shaping influences given to us by Adam, others, and ourselves. Then after you mix your bags with the baggage of your spouse, there is no way to avoid combustion in the home. Biff and Mable had preexisting baggage before they met. Lots of it. While they were dating, they sat their luggage aside and put their best foot forward. While dating, they were determined to be on their best behavior. It’s like holding your breath for as long as you can. This idea is not a mandate from Scripture, but it is usually wise to date at least a year before you pop the question. A year gives you time to see the other person in more real ways. You can only hold your breath for so long. Biff would hold the car door open for Mable. He would send her flowers. Biff was always kind, sensitive, patient, and he loved attending their local church meetings. I’m not saying he was a total fake, but I am implying that he was not revealing the totality of who he was. I have called the dating season the artificial season where two people fake each other out as much as they can–until after they are married. As you have probably surmised, Biff and Mable are sinners. They not only came from their respective mother’s wombs speaking lies, but they created a whole lot of baggage before they met each other. Some of their baggage was their own doing, while the rest of it other heaped upon them. Either way, they both had un-dealt with baggage. They did not perceive or resolve many of their issues during their dating relationship. Their pre-marriage counseling was inadequate. They had no one with courage, grace, wisdom, or competence to speak into their lives. And they were “in love,” so there was very little anyone could tell them anyway. Biff and Mable left their baggage at the dating door and didn’t pick it up again until they were six months into their marriage. By then, it was too late–at least for them because they were too proud to let anyone in on their mutual marriage disappointment. An Aside – Most of my marriage counseling is either with couples who have been married five years or less or fifteen years or more. That is not an absolute rule, but a general one. If the couple is wise and humble, they will seek help early in their marriage. These spouses will not be like Biff and Mable. 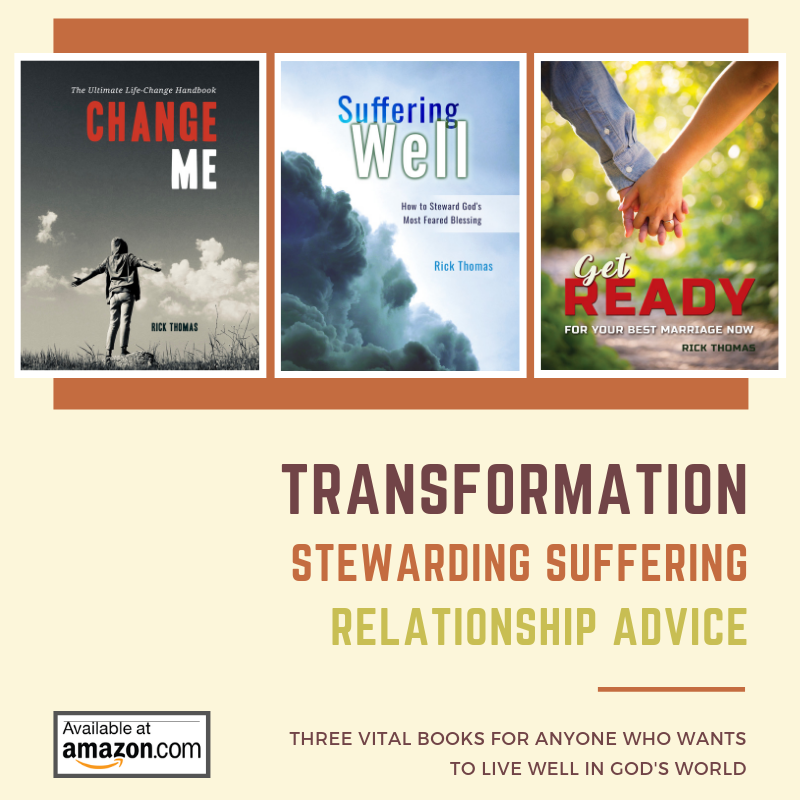 They will realize there is something not quite right and they are not quite sure the best course of action, so they reach out to their church for help. Find other distractions like ministry, hobbies, or grandchildren. Coexist in a house that is not a home until one of them dies. My appeal to any couple in trouble, regardless of the length of your marriage, is to get help. God’s grace is more powerful than your problems, no matter how involved you think your issues are. The Bible has a lot to say about working through conflict. There is a plan for sin, and it begins with the gospel. The only requirement is humility (James 4:6). Though you may have begun on the wrong foot, it does not mean you have to stay that way. God came to redeem and restore that which we can’t fix. Fixing broken things is at the heart of the gospel. I appeal to you to get help today! If you need a counselor, go here. If you need some “coaching” direction, go here. If we can help you in some other way, go here. Want to talk about this article? Go here to our free community forum. Be sure to login with your free username and password.